- James Elkins, On the Strange Place of Religion in Contemporary Art (Routledge 2004), 115. “We’re not here for conflict,” John Franklin announced placidly from the podium as he peered over his spectacles at the audience, “but for conversation.” Respect, curiosity, and excitement were in the air as the evening’s conversation commenced. Last night Imago hosted a guest lecture by James Elkins, art historian, critic and professor at the School of the Art Institute of Chicago on his work related to the striking absence of religion in the contemporary art world. The problem is three-fold, according to Elkins: (1) religion is absent from contemporary art except when the object of criticism, (2) religion is absent from recent art historical and critical literature, and (3) religion is absent from the pedagogy of studio art. 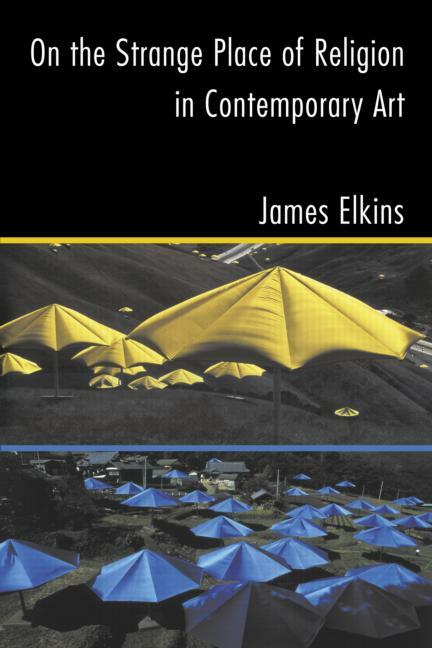 If an you want to make it as a contemporary artist in the art world, Elkins wryly recommended, only make art that is ambiguously critical of Western religion (the more ambiguous the better), if you decide to allude to religion at all. Religious artists (particularly those who subscribe to well-known world religions like Christianity, Islam, and Judaism), as a result, either are unable to express their religious convictions in their art or are marginalized in the art world as sell-outs. The contemporary art world has become so closed off to Western religion, said Elkins, and any art that “comes out” as being motivated by religious belief or as containing religious content easily gets dismissed by the art world or sidelined. While some artists experience some success within the Christian community, they are not recognized as authentic artists by the larger contemporary art world. The bottom line is that artists who want to use religious symbols, liturgy, or ideas in their art without being overtly critical of them or artists who openly profess their religious beliefs are just not often welcome in the contemporary art scene. Elkins suggested that contemporary art can be enriched by a change in attitude toward religion, and vice versa. If only “religionists” (religious believers) could be invited to the secular conferences, maybe there could be enrichment on both sides. The only way to deal with this impasse, says Elkins, is for secular institutions to act first: “But for any of these things to happen, secular institutions have to lose some of their phobia of religion.” Unfortunately, it’s a difficult task. How do we get art and religion into conversation and still avoid the possibility that they might damage each other? Last night’s conversation opened up a whole range of important questions that need asking on both sides. Among these is the question of accessibility and authenticity: how does an artist make art that is authentic but still accessible to a specific religious community? One of the problems with religious art, for the contemporary art world, is that it’s too accessible; it’s so tailored to a certain community that an artist isn’t given the proper creative freedom. Elkins pointed to recent examples of art commissioned for religious use, showing that they lagged behind in the art world because of the limitations placed on them by accessibility and the pressure to avoid being offensive. Is it possible for an artist to make art that is accessible enough to a religious community for public or liturgical appreciation without selling the artist’s authentic creativity short? To what extent and for what purpose should Christian communities use art in their community liturgical practices? These questions are live ones in our religious communities, affecting the way we think about our places of worship, our music, and the symbols around which we form our communities. I’d like to thank James Elkins, John Franklin and Imago for hosting this important event and for contributing to the opening up of a much needed conversation between contemporary art and religion. For more on Imago, check out imago-arts.org. Further information about James Elkins and his research can be found on his website at www.jameselkins.com. It would have been fun to address some of these questions about religion and art in our IDS course. I suspect that how we understand or define religion will radically effect how we conduct the search for religious symbols in contemporary art. Perhaps one reason many have a hard time finding religious symbols in contemporary art is due to divergent understandings of religion found in church communities and the contemporary art world. Obviously I wasn’t at the lecture, but I’d be interesting in hearing how you, Matt, think James Elkins or John Franklin could have contributed to our IDS discussion on the nature of religion? Did either seem to have similarities to one of the 8 (9+?) theories of religion discussed? How does this influence their understanding of religion and art? Hey Caleb! Thanks for the comment. Great question. During the Q and A time of the lecture, someone who seemed to be deeply involved in the art world commented with surprise that Elkins thought there was no religion in the contemporary art scene. Her experience was that most artists were deeply concerned with expressing their beliefs and convictions. Elkins replied with a distinction between religion and spirituality, saying that individual spirituality is everywhere in the art world, but any kind of solidarity to organized religion is taboo, especially to the major Western religions. So it seems like "spirituality" is roughly the equivalent of the idea that religion is a way of life that pervades every aspect of life. And according to Elkins, that does come out in art. But when we start talking about religion as a language of symbols, liturgy, and common values, the art world starts to cringe. It seems like some of these emphases on spirituality instead of organized religion run parallel to a deep movement in Western culture. Our identities as we understand them are not grounded in our religious communities, even if we are deeply religious, as much as they are built individually. But I wonder (and I would love to hear someone more knowledgeable of contemporary art comment about this) if there is a way in which the contemporary art world shares similarities with religious communities. Are there certain symbols that are understood as shorthand for common values (artistic or otherwise)? Are there certain conventions that an artist needs to remain within (or break out of) to be welcomed into the art community? Would it be too far to suggest that part of the reason that the art world has such a problem with organized Western religion is because it serves a similar function, but as an alternative "religion"? I think taking a close look at what we mean by "religion" really opens up this question. I'd love to hear some more of your thoughts, Caleb, and also I'd be interested to hear from someone who might have more knowledge about the contemporary art scene than I do. My new exhibition is "The Seven Deadlies." It explores the seven deadly sins - a construct of traditional Western Catholicism from a Protestant and deeply personal perspective. When one indulges in the personal viewpoint - either spiritual or secular, one hopes to scrape against the universal embedded elements that tie us to others. The point is well made that religion needs to be expressed as spiritual or an individual expression in order to be accepted by the art world. But that forces us back to the "testimony" - the glorious under-girding communication device that first spread the good news and continues to spread it. My testimony is visual. I made an object. I will tell you your thoughts. My God is good, said the priestess as the firelight flickered on the cave walls. Oops, sorry, I just flashed back to the caves of Lascaux, when the priest artist first appeared with magic ibex and bison. I have something better than bison to summon to your table. I have met God and my art will tell you about the one I know. He calls himself the bread of life, the waters that are never exhausted, food you know not from which one thrives in and out of season. And my art is good. It stands alone even if you can't stomach my God. It is the artist who speaks in the symbol as icon who is flopping alone, exhausted on art's shores. That is our loss for that language has its own beauty. I find the distinction between “spirituality” vs formal religion problematic, especially when this distinction is associated with an individual vs a more communal understanding or religion. For the most part, I see this as a false dichotomy. It’s difficult for me to conceive of a “spirituality” built individually. An individual’s understanding of religious/spiritual themes depends and come out of an inheritance or community. Similarly, a community depends on individuals for its existence. For this reason addressing a question about the existence of religious themes in contemporary art by simply distinguishing between “spirituality” and “religion” is problematic. I have no idea if this was Elkins’ intention, I’m just reading into you comments, so correct me if I’m way off. I agree that there is a disconnect between the art community and more traditional religious communities. Your observation that both communities have their own sets of conventions and language is insightful. I also suspect a reason they find it difficult to communicate with one another is due to a language barrier or lack of translation work. In my experience, contemporary art often expresses deep seeded religious themes/values (justice, forgiveness, charity etc) which religious language, symbols, and liturgy also attempt to express. For many, the way religious symbols are used, or have been, betray the values they attempt to represent. This is most likely one of the reasons for the allergic reaction. Perhaps one way of facilitating dialogue between these two groups would be to emphasis their common inheritance. Recognition by the art world that “spirituality” expressed in contemporary art is indebted to a cultural inheritance, could give it a reason to explore and preserve this inheritance (an inheritance they hold in common with more traditional religious communities). The same recognition by religious communities would give them reason to explore contemporary art—artistic statements of critique along with all the rest. The “spirituality” of contemporary art allow us to approach the bible and religious symbols through a new set of symbols and language, which could make it meaningful for those for whom religious symbols have lost their meaning. At least I’ve found this to be the case with philosophy, my contact with contemporary art is second hand at best. I’d be interested to hear from you or someone else how the art community could be compared to a religious one? Great points, Caleb! I like where you're going with your last paragraph, looking for ways to get art and religion talking in a mutually beneficial way. It seems to me that it starts to look a lot like interreligious dialogue at this point. Regarding the way you break down the distinction between spirituality and religion, I wonder if there's a way in which the distinction might be a helpful one (on this point, I'm not representing Elkins because this is outside the bounds of the lecture, and I'm not sure what he says on this). I wonder if there's an organizational element that distinguishes spirituality from religion. I think you're absolutely right that spirituality comes from an inheritance or community, but I think in our pluralistic society, people are able to move between several different communities with many different inheritances. Given the variety of inheritances from which to draw, an individual actually can build their own spirituality, taking little bits from several different systems of belief without identifying with one. Of course, in actual practice, it's difficult, if not impossible, to pick and choose without being influenced by a community in the first place. But I think there is something really complex going on here that we can't just flatten down to one community inheritance per individual. In light of this, I'd like to echo your question. I think one of the issues here is really one of what qualifies as an organized religious community. At what point does a group of people choosing from a smorgasbord of beliefs start to look like a religious community? What is it that binds a religious community together? Doctrine? Common practice? Symbols? Ethical values? A shared narrative or mythology? I'm not really sure. What do you think? Also, I wonder if the art world shares with religion some of these elements that make a religious community a community? Interesting discussion. I'll have to summarize my comments and remove examples otherwise I'd commit the sin of my response exceeding the length of the original article. Art is a reflection of the mood of a larger culture. The art world is diverse and it has no unified opinion per se–it is a complex eco system, so please be careful about making sweeping generalizations about it. If our culture's norm is secular humanism—that will extend to its art. A factor missing from the discussion is that money and politics play a much bigger role than many in the art world are comfortable admitting. One could argue that institutional religion and art intellectuals share this similarity because both must exist within the finite constraints of culture and economics. Yet many in each group share an intellectual curiosity about the mysterious part of us that points towards the infinite. When there's self deception about the role economics and politics may play I feel that can be a form of gnosticism which scorns the material. An odd state if accurate for art which fundamentally needs materials to exist, even if those materials are just humans performing ephemeral acts. Thanks for the discussion, I enjoyed all your comments and parsing my response.